In a day game a week-ago Sunday, first place Manchester came in and beat the Phantoms 3-1. It was a competitive game that the Phantoms led 1-0 before falling behind 2-1. The Monarchs added an empty net at the end. Mid-week last week the Phantom headed down to Norfolk and got the win in a 3-2 game. Zepp was in goal and Akeson and Laughton were the top two stars of the game. 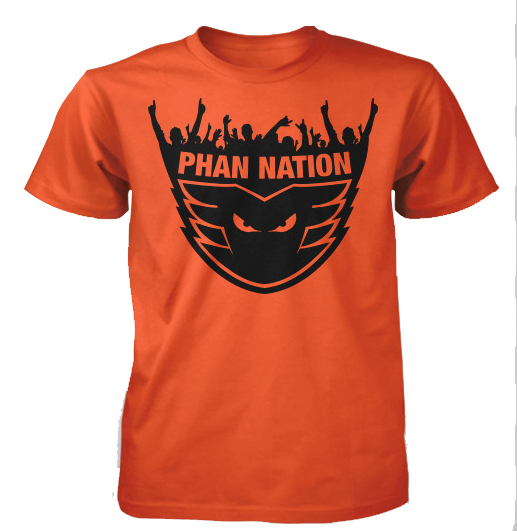 The Phantoms then trucked it up to Bimmington where they lost a hard-fought game by a 4-3 tally. They fought back from a 2-0 deficit but some questionable defense left Zepp out to dry a couple times, which thwarted the comeback. Akeson was a star of the game. The team is in 12th place and somehow still not mathematically eliminated from the playoffs. Their record is 31-31-6-1. The team has solidified it’s fourth place spot in average attendance, and it wouldn’t be out of the question to catch third-place Providence if these last mid-week games do well at the gates. The team is now ranked 18th (of 30) in both Power Play and Penalty Kill. Darroll Powe is now working out lightly, but is not yet skating. He’s thought to have suffered another concussion. Jay Rosehill was suspended by the AHL for three games for “leaving the bench” although I’m unsure how else he was supposed to get to the locker room. It stemmed from an intermission fracas at our last home game; he missed the road trip and should return tonight. Zach Stortini was named “Man of the Year” by the “IOA/American Specialty AHL” for his work in the community and with the fans. Unconfirmed rumors are that Stortz and his wife have purchased a house locally, and that he’ll be back next season. Kevin Goumas was injured in the game in Bimmington. His status for tonight is unknown at “wordpress” time. Danick Martel could be a candidate to joint the Phantoms soon as he was signed as a free-agent out of Quebec Juniors and his team has been eliminated from the playoffs. He’s a scorer, but thought to be undersized for the AHL. We’ll see, I guess. The Pens are back as the Eastern-PA series continues. Game Time: 7:05PM puck drop; 6:00PM doors open; Chickie’s by 5:00 if you want a table. Tickets: The VIP package has been sold out for this game, but otherwise, seats are widely available. Traffic and Parking: Recent media reports of policy changes and rate changes for meters–but changes won’t take effect until after it goes through city council. Changes could be designed to drive parking more towards the decks and lots and away from meters in the immediate arena zone. Park as per usual tonight. 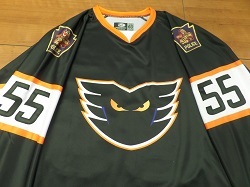 Allentown Police Department Night: The Phantoms will wear (for the game? Warm Ups? It’s not clear…) the jersey pictured above to honor the local men and women in blue. The jerseys will be auctioned off (silent-style) at the upcoming games. Proceeds from the auctions will benefit the Police Department (and help us pay for downtown security and overtime?). Guns N’ Hoses: Stick around after the game (you’ll be herded into sections 104-105 most likely, and the concessions will be closed) to watch the Police Department team take on the Fire Department team in a hockey grudge match. Or, whatever. Sounds cool though. Happy Hour: What better way to get a good Police/Firefighter hockey game than to have cheap beer during the Main Event. It’s the last mid-week happy hour of the season. $2 Coors Light at the Coors Light bar behind section 108 from doors until the start of the second period. 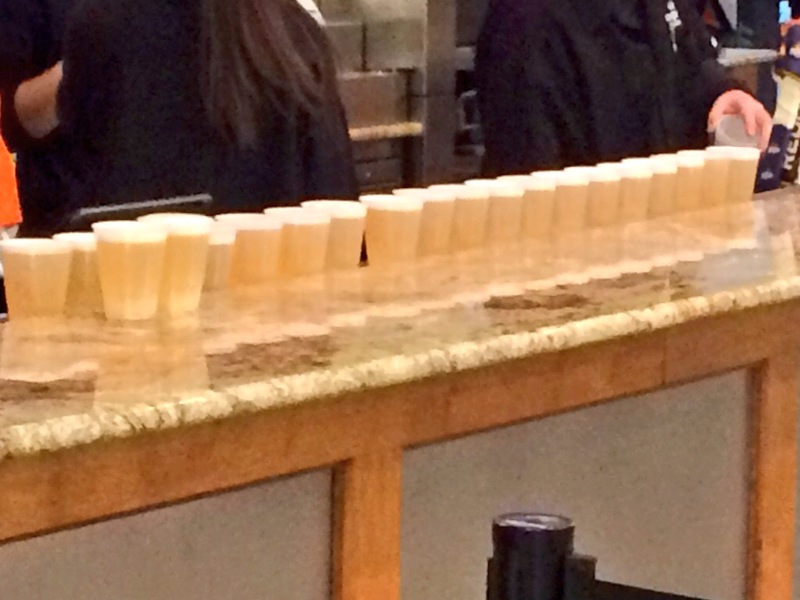 At that point, the beers return to full-size and full price. 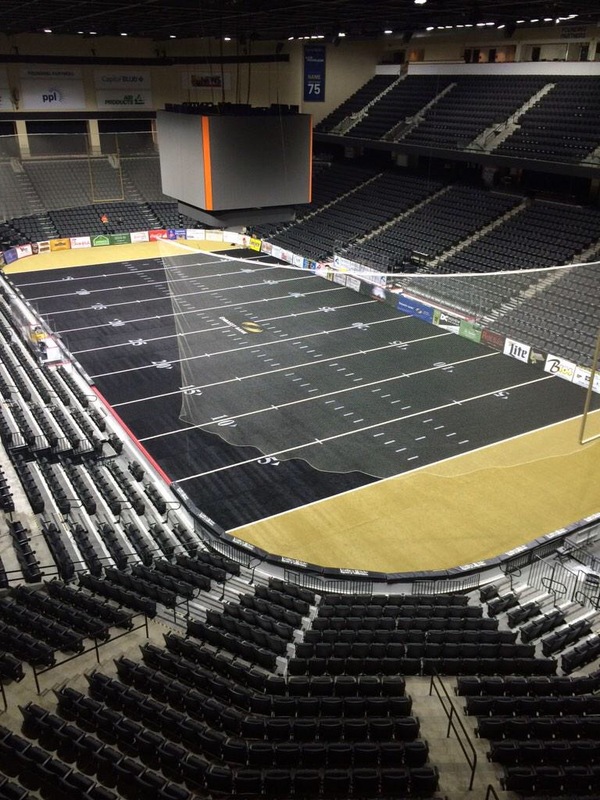 SteelHawks Night: SteelHawks professional indoor football players, staff, and cheerleaders will be on hand. Stop by their table and say hello–maybe even plan to pick up some tickets for their home opener THIS SUNDAY afternoon at the arena. It’s going to be great–I’m telling you. Stay tuned on the blog for Game Day information, as well as rosters and other news. Watch to see if the new guy Martel gets added to the roster to help out on offense. Watch to see who starts in goal for the Pens: Murray again would be probable, but Zatkoff is a possibility. They also have an ATO goalie on the team, but it’s doubtful he will play. Murray has something like 11 shutouts including I think 2 against the Phantoms. He’s 12-2-1 since January 31, BUT the two losses were versus the Phantoms! Watch for Pens number 42 Kasperi Kapanen. He’s the 2014 first-round pick of the Penguins and should be making his AHL debut tonight. He’s been skating with their top line, I believe. Will he get an AHL welcome from Storts or Rosie? He’s 18, from Finland, and not a huge dude. Watch for my guy Pettersson to be active. Petey “owns” Murray–could be our top weapon–especially if he has to play forward with injuries and whatnot. 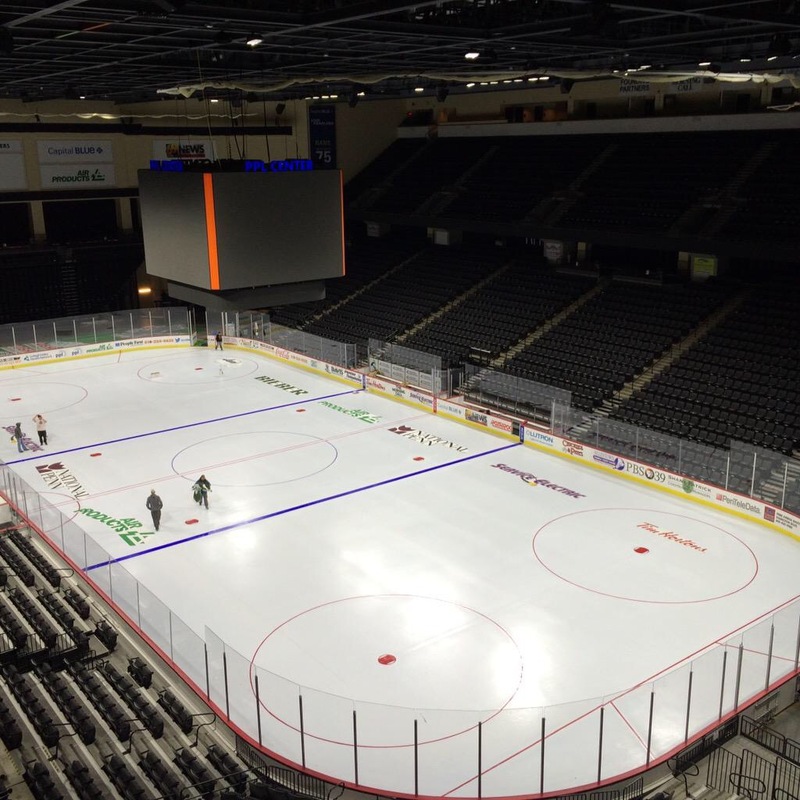 Watch to see how the ice is doing. 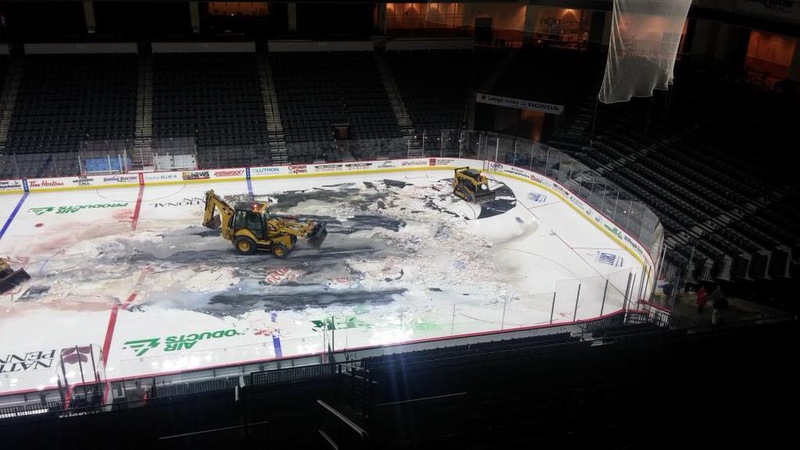 They had to rip it up for the circus, and rushed to get it re-frozen and lined out and so on. Hopefully it’s had time to really freeze in, but with the short time it could be a little soft tonight. Watch for the Penguins to have a little extra jump tonight: If they win, they clinch a playoff spot. The Phantoms remain home for back-to-back games against the Norfolk Admirals on Friday and Saturday. It will be interesting to see how they do attendance-wise as they’ll go head-to-head versus the IronPigs for sports fans those nights. Use the code FOLLOWER to get discounts on tickets for Friday 4/10 and for Sunday 4/19. The code should be valid until tomorrow night, or while supplies last. It’s “Meet the Players” dinner over at the IronPigs with proceeds to benefit IronPigs Charities. There were still seats available as of yesterday–you get dinner and two players will be sitting at your table! If I hadn’t met them all on Monday–and if there wasn’t hockey tonight–I’d be all over that! If you’re not up for hockey tonight, give them a call and see if they have any tickets left. Wow! All fans of the Pittsburgh Penguins (hiding in closets or otherwise) have to be openly excited. What a prospect the 18-year-old Kasperi Kapanen seems to be, judging from his performance against the Lehigh Valley Phantoms in his very first professional game in North America. Showed considerable speed and skill in the offensive zone after picking up a Phantoms turnover just before he rocketed a shot right over the shoulder of Rob Zepp. Demonstrated good vision with a great pass to set up Tom Kuehnhackl’s wonderful re-direction in front. Appeared to be the most dominant player on either side all night long without question and the # 1 Star of the Game was well deserved (this in the same game that saw the Wilkes-Barre Scranton goaltender Matt Murray make a number of saves at close range and rack up yet another shutout). With 29 saves, the Berlin Wall almost blocked thirty or more shots for the sixth consecutive game … the four-minute double-minor penalty taken by Lehigh Valley goon Jay Rosehill certainly proved to have tragic consequences for coach Terry Murray’s troops.